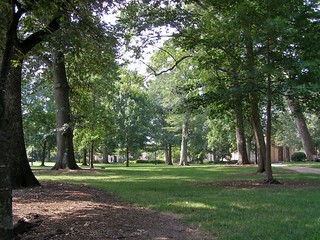 Why the campus of the University of North Carolina is called so. . . .
View across the Quad in the relative quiet of the summer sessions. An interesting little book, the UNC CHAPEL HILL'S NOBLE GROVE: A Walking Tour of Campus Trees, by botanist Michael A. Dirr, 2010, tells all you might want to know about the campus trees!